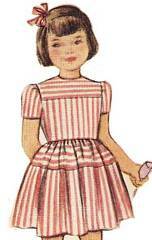 Dress with front and back yokes, back buttoned bodice and ties extending from side seams to form back bow. Straight or puffed short sleeves. Dress skirt has upper and lower sections which can be styled with contrast or inserted lace or eyelet trim. Girls Size 3; Breast 22; Waist 20.5. 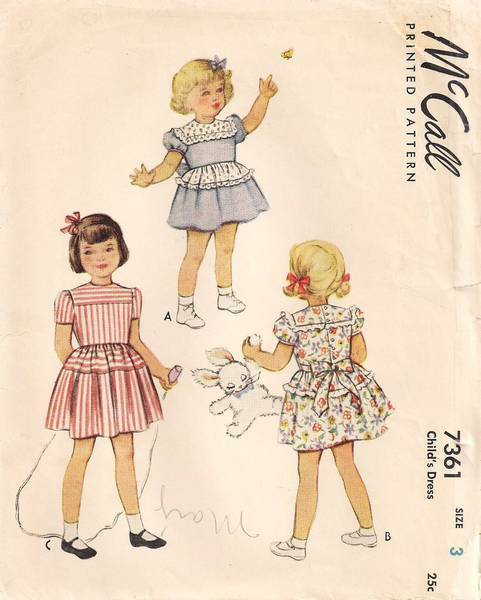 Pattern is unused, complete with the pieces in original factory folds. Envelope is age toned and has tape mends/reinforcements on edges; lower right corner is torn.